On a quick trip out to the nursery last week I came across a gorgeous plant with spiky pink flowers that made me stop in my tracks. October is not the time of year I would expect to see Celosia in full glory, but this cultivar, called ‘Cramer’s Amazon’ looks fantastic even now. Nestled into a mixed annual bed, it fits right in with Verbena bonariensis in the backdrop. 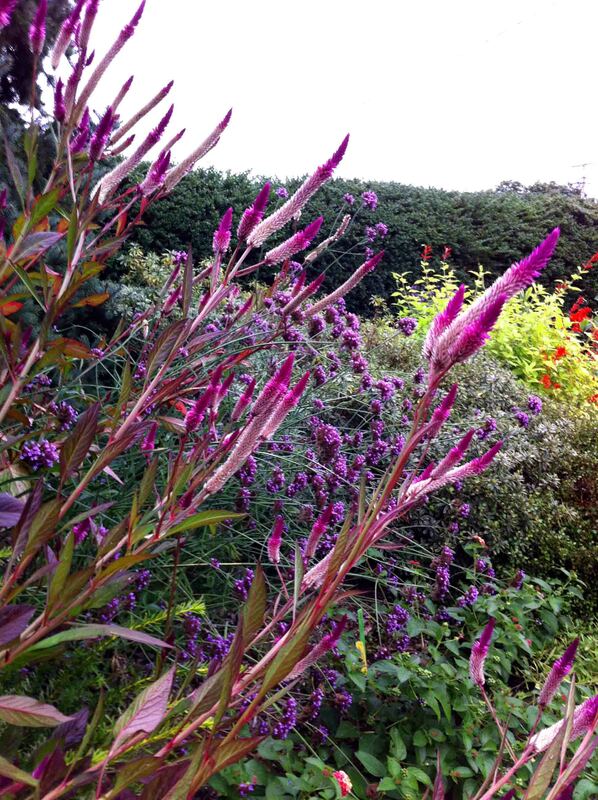 Celosia ‘Cramer’s Amazon’ was discovered in Peru and features magenta blooms. It is recommended to pinch the plants back when they are smaller to produce more stems, but if you leave it undisturbed, it can grow up to 9′ tall! The flowers are excellent for cutting and can also be dried. The reddish tinge to the leaves and veins are also ornamental in my book. Try it out in a garden bed with other annuals like Verbena or Salvia or try it next to fail-proof perennials like Rudbeckia or Perovskia for an Erb-approved planting scheme!